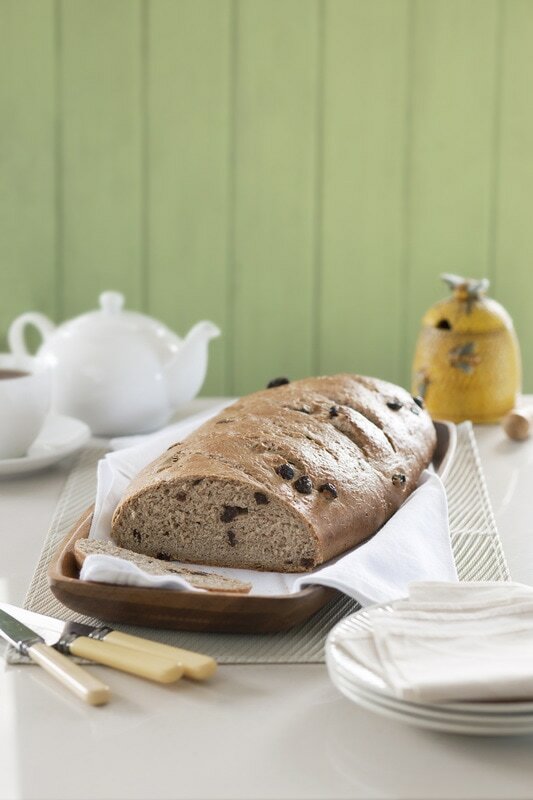 I developed this loaf to bake at Easter or as a weekend loaf – it keeps better if sliced and frozen as it doesn't have any additives to keep it fresh like the commercial types. Preheat oven to 200ºC. In a bowl sift high-grade flour with spice and salt. Stir in wholemeal flour. Set aside. In a large mixing bowl place oats. Cover with warm water, honey and sprinkle over yeast. Leave for 10 minutes or until frothy. In a small bowl place raisins and cover with water, to soften. Once soft, drain raisins. Add all dry ingredients except raisins to wet mix along with oil. Use a blunt butter knife to chop through until dough comes together. If needed, add a little extra water. Mix raisins into dough. Transfer to a greased bowl and cover with greased plastic wrap. Leave to double in size in a warm place for about 20 minutes. Tip dough onto lightly floured bench. Knead a little to shape into a large long thin oval loaf. Or shape into two small oval loaves. Place long loaf diagonally onto a lightly greased oven tray. Brush dough with milk then use a bread knife to cut five slits into the top of the loaf. Leave another 25 minutes until doubled in size. Bake for 25 minutes until golden. Allow to cool for 10 minutes before slicing. Tip: To speed up the ‘proving’ time where the dough rests, the gluten develops and the dough doubles in size: use a microwave-proof bowl, place the dough in the microwave and set it on the lowest temperature for 1 minute. Wait for 10 minutes and repeat. Or place dough in an oven drawer to warm quickly.